Around the Archean-Proterozoic boundary, Earth began a transition phase in a number of different areas. The two supercontinents that came together in the Neoarchean began to break apart in the Paleoproterozoic, and a major glaciation (the Huronian) occurred from 2.45 to 2.22 Ga. There were large eruptions of flood basalts and an increase in atmospheric oxygen, eventually leading to the oxygen-rich environment we live in today (Melezhik et al., 2005). Some researchers have suggested that the rise in O2 triggered the glaciation, as methane in the atmosphere was oxidized to CO2, thereby reducing greenhouse gases (Kopp et al., 2005). 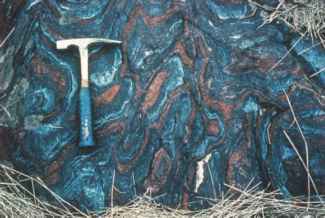 Banded iron formations (BIFs) also reached their greatest extent during this time. As a result of all of these interrelated events, especially the rise of free oxygen, large transformations in biogeochemical cycles must also have taken place (Konhauser, 2007). Although the upper parts of the ocean gradually became enriched with oxygen, it is hypothesized that the deeper parts of the ocean remained anaerobic and were rich in hydrogen sulfide (H2S). The origin of oxygenic photosynthesizers (those that produce oxygen) represents an important benchmark in biological evolution (Schopf et al., 1983). Among the prokaryotes, cyanobacteria are the major organisms that fill this eco-logic role. They were no doubt present in the Archean, but perhaps not in sufficient numbers to make a difference on a global scale. In the Paleoproterozoic, however, this condition began to change and the increase in numbers of these organisms and their distribution on Earth eventually resulted in an atmosphere enriched in oxygen. The presence of free atmospheric oxygen subsequently resulted in the ozone layer, thus making it possible for organisms to live on the land without being destroyed by ultraviolet radiation (Chapter 6). 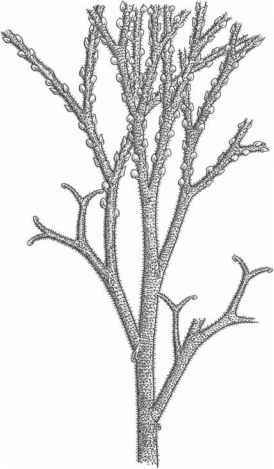 The presence of adequate oxygen was also necessary for the evolution of multicellular animals (Berner et al., 2007). The evolution of cyanobacteria thus signaled a revolution in life on Earth. These organisms were not only able to utilize the most abundant form of energy on Earth—sunlight—to split water molecules, but were able to do it more efficiently. Since cyanobacteria utilize both photosystems I and II (as do all green plants), their appearance in the fossil record also signals the evolution of an advanced biochemical system compared to the single system in other photosynthetic bacteria. It has also been hypothesized that the appearance of cyanobacteria and oxygenic photosynthesis resulted in a rapid colonization of shallow-water habitats on Earth (Nisbet and Fowler, 1999). There has been a continued controversy over the timing of the first appearance of oxygen-producing photosynthesizers (Towe, 1990), that is, cyanobacteria. Hofmann and Schopf (1983) suggested that some of the organisms found in Paleoproterozoic biotas represented aerobic photoautotrophs, cyanobacteria, based on the presence of morphologies comparable to extant cyanobacteria. Stromatolitic evidence of early photosynthesizers comes from Neoarchean (2.7 Ga) lacustrine deposits from Western Australia (Fortescue Group) (Buick, 1992). In this study, a combination of morphologic, geochemical, and sedimentologic data were used to propose that the stromatolites were probably formed by filamentous, phototropic bacteria. Based on the complex trophic system in these lakes, Buick concluded that O2-producing photosynthesizers must have been present, since a deficiency of sulfates in the system would have excluded anaerobic photosynthesis. Summons et al. (1999) reported the occurrence of 2-methylhopanoids or their derivatives, which represent a biomarker for cyanobacterial photosynthesis, in rocks as old as ~2.5Ga. They also noted that the abundance of these biomarkers at this time supports microfossil evidence that cyanobacteria arose before 2.5 Ga (Brocks et al., 2003). mid-ocean ridges. Several studies have suggested that iron-oxidizing bacteria (chemolithotrophic organisms) could have precipitated the amount of iron present in the Hamersley Group of Western Australia, even at cell densities lower than those seen in modern coastal waters (Konhauser et al., 2002; Kappler et al., 2005). Thus, it can no longer be assumed that the presence of BIFs represents proxy evidence for early oxygenic photosynthesizers. The distribution of other types of rocks, however, does appear to be important in dating the origin of an oxidizing atmosphere. Detrital uraninite, siderite, and pyrite occur in 3.25-2.75Ga fluvial deposits from Australia, but are extremely rare after 2Ga (Rasmussen and Buick, 1999). There is evidence that these minerals had been transported in water that was well aerated. All of these compounds are known to be unstable under oxidizing conditions (J. Walker et al., 1983). In addition, red beds are known to be rare or absent in the Archean. Red beds obtain their characteristic color from the presence of ferric oxides, which form as a result of subaerial oxidation, usually in fluvial rock sequences. Despite the occurrence of suitable rock sequences on the early Earth, red beds are far more abundant in the Proterozoic than in the Archean, and this change is generally attributed to an increase in atmospheric oxygen around 2.3 Ga. Another method to extrapolate paleoatmospheric O2 levels involves the fractionation of sulfur isotopes (Pavlov and Kasting, 2002). Using this method, Bekker et al. (2004) suggested that the atmosphere already included pO2 levels >10~5 of the present atmospheric oxygen levels (PAL) by 2.32 Ga. The timing for the disappearance of uraninite deposits, appearance of red beds, decline of BIFs, and shift in sulfur isotopes approximately coincides at ~2.3-2.2Ga, and this time no doubt represents evidence of global atmospheric oxygen, even though the levels were lower than today. The only viable source for this oxygen is the product of photosynthesis by cyanobacteria, since they represent the earliest oxygen-producing photosynthetic organisms in the fossil record. Oxygenic photosynthesis certainly must have evolved earlier than this time, however, in order to build up enough oxygen in the atmosphere and ocean to leave a chemical signature in the various rocks. Tomitani et al. (2006) used molecular phylogeny of extant cyanobacteria, within the context of geochemical evidence, to suggest that oxygen levels rose rapidly between ~2.3 and 1.9Ga. These results coincide with the disappearance of BIFs and suggest that oxygen levels were probably 10% PAL by 1.9Ga and 100% PAL by the Neoproterozoic. Fossil evidence for these oxygen levels, however, is indirect. Some cyanobacte-ria form specialized cells called heterocysts, where nitrogen fixation occurs in an anaerobic environment. The evolution of heterocysts is thought to have occurred in response to increasing oxygen levels, but the only Precambrian evidence of heterocysts is indirect. Although heterocysts have been reported from the Gunflint Chert (discussed later), these structures could also be interpreted as the result of diagenesis. Golubic et al. (1995) proposed that the Mesoproterozoic rod-shaped microfossil Archaeoellipsoides represents the akinetes of a cyst-forming cyanobacterium and attribute this fossil to the Nostocales, a group of heterocystous cyanobac-teria with living members (Chapter 3). Based on the mono-phyly of the extant heterocystous forms (Tomitani et al., 2006), Archaeoellipsoides is hypothesized to be the earliest evidence of heterocyst-forming cyanobacteria and used as a benchmark for paleo-oxygen levels (Tomitani et al., 2006). (Pilbara Craton). Additional data from carbon isotopes also support widespread oxygenic photosynthesis in the ocean before the land (Eigenbrode and Freeman, 2006).